Tour to Saint Petersburg. Trip to Russia. Legendary tour. Dvortsovaya Ploshchad. From Nevsky Prospekt or Gostiny Dvor metro, a 15 minute walk west along Nevsky prospekt brings you to Dvortsovaya ploshchad (Palace Square), where the stunning green, white and gold Winter Palace (Zimny dvorets) (now the part of the Hermitage Museum), appears like a mirage (the prettiest way to view it for the first time is by entering through the grand arches at the end of Bolshaya Morskaya and see it slowly emerge), its rococo profusion of columns, windows and recesses topped by rows of larger-than-life statues. 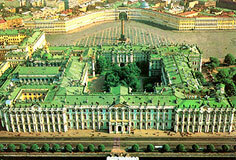 A residence of tsars from 1762 to 1917, it's now the biggest part of the Hermitage art museum. During Bloody Sunday (9 January 1905), tsarist troops fired on workers who had peaceably gathered in the square - the shootings sparked the 1905 revolution. And it was across Dvortsovaya ploshchad that the much exaggerated storming of the Winter Palace took place during the 1917 October Revolution. There was gunfire before the Provisional government in the palace surrendered to the revolutionaries, but the famous charge across the square was largely invented by the film maker Eisenstein. The 47.5m Alexander Column in the square commemorates the 1812 victory over Napoleon and is named after Alexander 1. The former General Staff buildings of the Russian army (1819-29) curve round the south of the square in two great blocks joined by arches, which are topped by a chariot of victory, another monument to the Napoleonic wars. Ploshchad Dekabristov. West of the Admiralty, ploshchad Dekabristov (Decembrists' Square) is named after the first feeble attempt at a Russian revolution - the Decembrists' Uprising of 14 December 1825. Inspired by radical ideas from France during the Napoleonic campaigns, young officers tried to depose the new Tsar Nicholas I by drawing up troops in the square. But they allowed their opponents to argue with them and were finally dispersed with grapeshot. Most of the leaders ended up on the gallows or in Siberia. 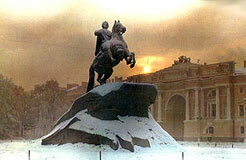 The most famous statue of Peter the Great, the Bronze Horseman, with his mount rearing above the snake of treason, stands at the river end of the square. It was cast for Catherine the Great by Frenchman Etienne Falconet. The inscription reads To Peter I from Catherine 11- 1782. This statue, along with the view of the SS Peter & Paul Fortress against raised drawbridges during summer white nights, has become the trademark image of the new spirit of St Petersburg. Most of the west side of the square is occupied by the Central State Historical Archives in the former Senate and Synod buildings, built in 1829-34. The Manage Central Exhibition Hall across the street used to be the Horse Guards' Riding School (constructed in 1804-07 from a design by Quarenghi). St Petersburg History Museum. Located about 600m west of ploshchad Dekabristov, at Angliskaya naberezhnaya 44, this interesting museum focuses on St Petersburg since the 1917 revolution. Though there's no material in English, it's good on the 1941-44 siege.